It is a challenge to take care of a baby and it becomes more difficult when he is too small to speak. As a parent, one needs to closely observe the signs and symptoms that may indicate illness or poor health. 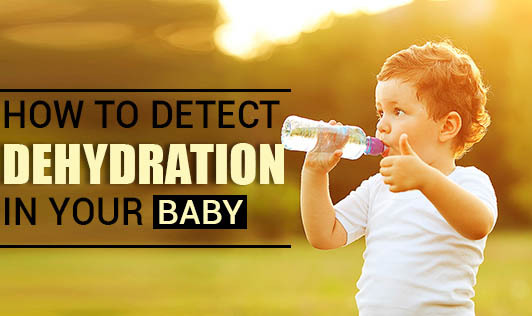 Dehydration may be fatal for the baby, so being alert and to act quickly during an emergency is important. Excess fluid loss which impairs the normal functioning of the baby’s body. What is the cause of dehydration? The causes of dehydration in a baby may be many. It can be due to lack of nutrition or breastmilk, due to diarrhea, vomiting, excessive sweating, or fever. The effects of dehydration can be fatal. It can cause kidney failure, seizures, coma, and even death. Dehydration may occur in any weather condition, but is more common during summers. Parents should check for the signs and symptoms often during this weather condition. If the baby has fever, he will be sweating, so have a close watch to prevent fluid loss. If the baby is on breastmilk make sure he is fed on demand, often. Dehydratin can be prevented if he is adequately breastfed. Bottle fed babies can be given cool, boiled water in addition to their feeds.